Efflorescence – a pretty word for a not-so-pretty problem. As someone invested in masonry, perhaps you’re not so keen on etymology; but here, the word’s origin actually signifies something. The term comes from the Latin efflorescere, meaning to blossom outward. While efflorescence has little to do with flowers, the white deposits that are commonly associated with this chemical process similarly seem to spring up out of nowhere. And like unruly, front lawn grass after a bout of rain, their growth is difficult to curtail. 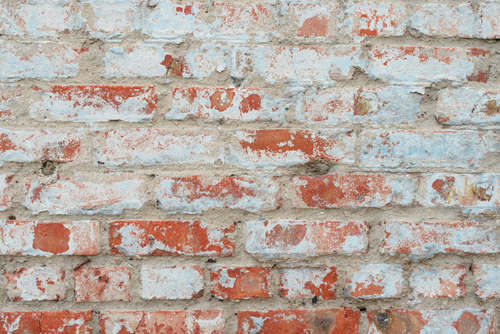 So, what is happening to your brick masonry exactly? Read on find out what efflorescence is, and what steps you can take to prevent it. If you’re not familiar with masonry, efflorescence can be hard to identify. Walking out in front of your office building, you notice a white, powdery substance lined haphazardly upon the surface of the brick wall. You think that maybe some hooligan took talcum powder or chalk and defaced the façade of your structure. So, you wash it off with a hose and stay extra vigilant the next day. Except nobody shows up. In fact, the only thing that makes a second appearance is the fine, powdery substance. You say to yourself: There’s no way the construction of the building is causing this! After all, the brick was only laid a year ago. But that’s where you are mistaken. Efflorescence tends to occur about a month after the building is constructed, and in the worst-case scenario, can reveal itself up to a year later. It’s not a result of natural aging, but of compromised craftsmanship and specific building materials. Efflorescence is a symptom of a larger problem. Water-soluble salts must be present somewhere in the wall. Remember, this applies to every constituent part of the wall, not just the bricks themselves. Portland cement is often a key contributor to efflorescence in mortar and grout due to the presence of calcium hydroxide, according to the PCA. Moisture is key. Water allows salt to be rendered into a soluble solution, which can then act as a transporter for calcium sulfate. There must a path for these salt-based solutions to reach the surface. Porous bricks can absorb and wick water, allowing moisture to pass through via capillary action. Essentially, efflorescence happens because of excess moisture. Since the use of Portland cement and lime mortar is so pervasive throughout the industry (and the benefits of using it outweigh the potential downsides), avoiding the first condition is nigh impossible. The third condition can be combated with waterproof sealants and smoother brick materials. Standard-weight CMU is less porous than lightweight CMU, regular CMU is less porous than split-face, etc. But overall, brick is a naturally porous material. You can only do so much in a climate where precipitation is common. The most effective preventive measures related to the construction process. Compacted mortar work, as well as accouterments – overhanging eaves, copings, and flashings – will prevent water penetration and keep efflorescing salts from dissolving. It’s a little late for prevention. What can I do moving forward? If left unchecked, efflorescence can diminish the structural integrity of a wall. You’ll want to wash the brick using a chemical cleaning agent specifically designed for removing alkali sulfates. One such cleaner is called muriatic acid. Sandblasting is also effective but tends to damage the surface of the building material. After cleaning the surface with acid and letting the brick dry, the wall must be sealed.